Fans of adidas Basketball and the Crazy Light 2 see their names light up TD Garden at tonight's game. A little over a week ago, adidas Basketball launched a Facebook activation to coincide with the launch of the adiZero Crazy Light 2, giving fans the opportunity to see their name in lights for the NBA Playoffs. Thousands of fans across the country responded, and those who did received the ultimate payoff of seeing their name lighting up one of the biggest moments of the season. Fans that joined the conversation on the adidas Basketball Facebook saw their names projected on a massive, moving image of the adizero Crazy Light 2 displayed across Boston's TD Garden throughout Friday's Eastern Conference Finals game. 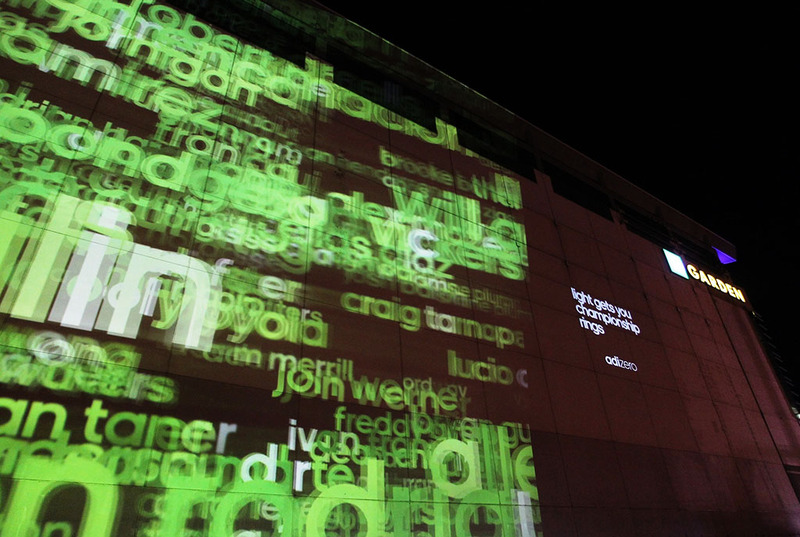 The fans that engaged the most saw their names appear brightest in the 20,000 square foot projection. Check out a video of the projection below and following the conversation on Twitter @adidasHoops using the hashtag #adiZero.